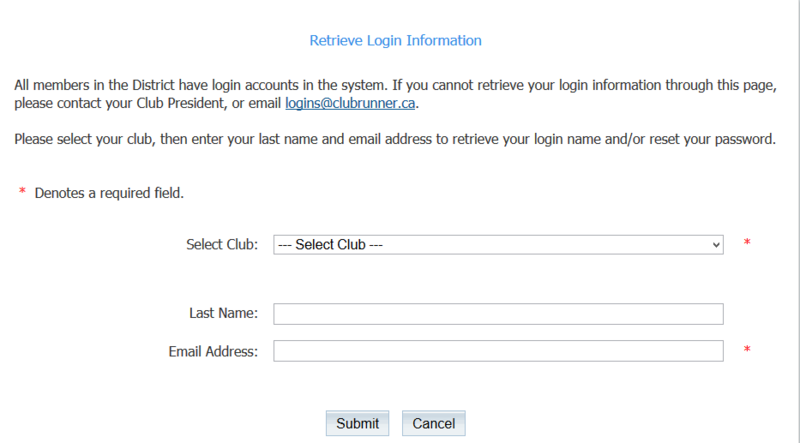 You must have a LOGIN name and PASSWORD to access the Member Area of this website. The login name and password that you used with the old district website will not work on this site. You will have to create a new login name and password for this website. 2. a pop-up window will appear (see image below). Select your club, enter your surname and email address. Click "Submit"
4. Collect your email (it may take a couple minutes for the message to reach you). Follow the instructions in the email to reset your password. "The email address you supplied does not match the one in your profile. Please try again". In this case please contact your club's secretary to ensure he or she has added you to the database. If unsuccessful, then please contact the Website Coordinator.